In addition to the events featured in the Bulletin, there are always more events and opportunities available to you. May this page serve you well! ECFL meets 5:45pm-7pm on Wednesday nights, March 13 – May 8 (no meeting on Wednesday March 27 due to Spring Break). Parent and child gatherings are led by April Cunningham and Kathy Feltes in St Dominic School Pre-K classroom and Teacher’s Lounge. Northfield Earth Day organizers are looking for residents interested in having a Free Food Help Yourself raised garden bed in their yard to share food with hungry neighbors. We would supply the garden bed frame, soil, and plants. Interested parties would provide the lawn space and care, and grow food for hungry people to take. Interested parties, please call Michelle Vosejpka 651-214-2352. The Annual 5K to prevent child abuse will be on Saturday, April 27th, beginning at 10:30 am at Sechler Park. Register by April 13th to run or walk. For more information, contact Annette Duncan: 507-363-1118 or info@centerforfamilyunitymn.com. I Cantanti Chamber Choirs of Northfield will present “The Great American Folk Era” on Sunday, April 28 at 7:30 p.m. at Armory Square in Northfield. Tickets are $10 pre-sale or $12 at the door, students and seniors $8 pre-sale or $10 at the door, and may be purchased at Paper Petalum or Rare Pair in downtown Northfield, or from any choir member. This activity is made possible by the voters of Minnesota through a grant from the Southeastern Minnesota Arts Council thanks to a legislative appropriation from the arts & cultural heritage fund. Emmanuel Masqueray was chosen by Archbishop John Ireland to design his monumental cathedral in St. Paul in 1905, which began a thirteen-year collaboration resulting in commissions for thirty churches throughout the Upper Midwest, including the Chapel of St. Thomas Aquinas on our St. Paul campus. Alan Lathrop was curator of the Manuscripts Division at the University of Minnesota Libraries from 1970 to 2008. He is the author of Churches of Minnesota and Minnesota Architects. 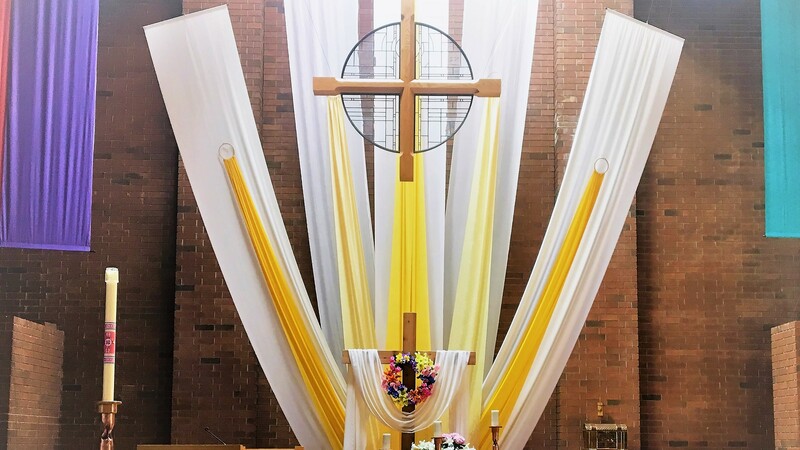 Saint Paul and Minneapolis Archdiocesan Council of Catholic Women will hosting their 87th ACCW Convention on Friday, May 3rd and Saturday, May 4th at St. John Neumann Catholic Church in Eagan, MN. Early register is thru April 16th for both days cost is $75, and/or Friday or Saturday cost is $40. After April 16th the cost for both days is $85 and/or Friday or Saturday cost is $50 per day. Great speaker Anne Attea, Amanda Virnig, Carrie Berran and Rebecca Koenig Roloff. The Friday Mass Celebrant is Archbishop Bernard Hebda and Saturday is Father Charles Lachowitzer. You can go on www.archspm.org/accw2019conv or call 651-291-4545 or call Marcia Simon at 952-652-2998 with any questions. Northfield Ecumenical Women will be hosting its annual program and “Fellowship of the Least Coin” on Saturday, May 4 at Little Prairie United Methodist Church in Dundas. Continental Breakfast at 9:30 is followed by “For the Little Girl in All of Us” Program. For information or to RSVP, email Fran at fholmblad@gmail.com. Honoring Loaves and Fishes – Franciscan International Award. The Franciscan Retreat Center’s 61st Franciscan International Award honors Loaves and Fishes, the largest open to the public free meal program in the state. Loaves and Fishes is guided by the vision that all people, regardless of socioeconomic, cultural, religious or ethnic background, deserve to meet their basic needs for food, dignity and respect. Come show your support for the work of Loaves and Fishes by joining us on Thursday May 9th at 6:00 PM at The Wilds golf and banquet facility in Prior Lake. It’s a lovely night out, a chance to dress up a bit and enjoy a good meal while supporting two local causes. To register call 952-447-2182 or visit www.franciscanretreats.net/franciscan-international-award. Our banquet tables seat eight. KC SPRING BREAKFAST – Sunday, May 5th from 8AM to 12PM, Immaculate Conception Church Basement, Lonsdale. All you can eat Pancakes! Eggs & Sausage. Proceeds to support Local Projects and Programs. On Sat., May 11th Jerry Kosak will present a concert of fingerstyle guitar, featuring himself and grammy-winning guitarist Pat Donohue (Prairie Home Companion) at the Northfield Arts Guild Theater. The concert will begin at 7:30 and end at 9:30 pm. Mark your calendars. The Mission Possible 5K will be held on Saturday, May 18. The race will begin at 8:00 a.m. with registration starting at 7:15 a.m. in the lower level of the church. Benefits go to support the Mission Trip to the Pine Ridge Reservation in South Dakota. “Home for the Summer” is a Catholic summer household experience for women who are interested in discerning their vocation while living in community for eight weeks. This summer program is for women who are college age up to 27. Applications are now being taken! Please see www.10000vocations.org for more information. Spring clean your marriage and bring it to an amazing level by attending the April 27-28 Marriage Encounter. You will receive a blessing that gives for generations to come! Weekends are held at Mt Olivet Conference and Retreat Center in Farmington. Visit www.marriages.org for additional information or call 651.454.3238. A Worldwide Marriage Encounter Weekend renews the promises you made to each other on your wedding day. Experience an enrichment for your marriage that will make your good marriage great! The next available Weekends are Jul 12-14, 2019 in Buffalo, MN and Aug 3-4, 2019 in Cedar, MN. Early registration is highly recommended. For more information visit our website at: twincitieswwme.org or contact Brent & Tracy at applications@twincitieswwme.org or 612-756-8720. ¿Están buscando un fin de semana perfecto? ¿Un fin de semana para acercarse más? ¿Quieren aprender una técnica de comunicación que le permita a cada pareja explorar áreas importantes de su relación en un espíritu de amor y comprensión? Un fin de semana del Encuentro Matrimonial Mundial es exactamente lo que buscan. Se pueden escapar de las distracciones de la vida cotidiana y concentrarse en su matrimonio. Los proximos fines de semana son Jul 12-14, 2019 in Buffalo, MN and Aug 3-4, 2019 in Cedar, MN. Para aplicar visite http://ncmarriagediscovery.org/faqs-es.php o para más información pónganse en contacto con Diego y Claudia Gonzalez: 704-698-1010 o Claudiagg@ymail.com. “Quo Vadis” is a camp experience for youth ages 14-17 to learn that nothing is more important than discovering God’s will for your life – and living it! Quo Vadis begins on Sunday, July 21 with 4 p.m. registration, followed by 5 p.m. Sunday Mass and concludes on Wednesday at 1 p.m. The camp includes Mass, prayer, campfires, talks, field trips to visit religious communities, confession, rosary along with lots of outdoor camp fun and recreation! Space is limited. For more information and to register, visit 10000vocations.org. The Holy Land Discovery cruise by Catholic Cruises and Tours will sail November 15th-November 22nd. Deadline to reserve is September 1st. Prices begin at $1449. Contact Eileen at 860-399-1785 or Eileen@CatholicCruisesandTours.com. Visit www.FranciscanRetreats.net for a list of all retreats. The 2019 Theme is “Rejoice and Be Glad: Our Call to Holiness in Today’s World.” It has weekend and midweek retreats all year for women, men, married couples, and special groups. Visit idretreats.org for more information about retreats available outdoors for youth and adults, infusing outdoor adventures with Theology of the Body insight. The Greater Minneapolis Council of Churches runs retreats in the summer and the year for Urban Immersion Service: learn to understand poverty and how to battle it. Learn NFP at home and at your own pace with the Home Study Course from NFP International, www.nfpandmore.org. Includes Ecological Breastfeeding (it really can space babies), a double-check system of fertility awareness, and Catholic teaching that’s easy to understand. You work with a live instructor by email and earn a completion certificate for only $70. Northfield United Methodist Church invites all parents grieving the loss of a child to participate in a support group meeting Tuesdays, April 30th through June 4. Contact Sherri Bunch Quaas with questions at 507-645-4300. The Volunteer Lawyers Network and the Immigrant Law Center of Minnesota sponsor this free legal service that provides private legal consultations with a lawyer on a walk-in basis. First-come, first-served until 4:30 pm. The sponsors are committed to making services available to all persons who meet our income guidelines and live in the Cannon Valley region. It is open the second Tuesday of every month from 2:00-4:30PM in the St. Dominic Youth Building. This is an open monthly group that runs October through May on the third Thursdays. The purpose is to provide an opportunity to dine with others, receive education about grief specific to the loss of spouse or partner, as well as the opportunity for support and to be with others who are facing a similar loss. Meetings are at 11:30am at the Hospital Board Room. Pre-registration is required. St. Wencelaus in New Prague is continuing its support for those separated or divorced in the area, the 1st and 3rd Tuesday of each month. All faiths are welcome. Call Deacon Bob Wagner (952-758-0463) or Mary (952-873-6781) for more information. A list of topics is available on the church bulletin board. There is a free class for older adults to maintain strength, balance, and fitness. Classes meet at the Milestone Senior Living Center in Faribault at either Tues/Thurs 5:30-6:30 PM or 9-10 AM. Classes are free; call Catholic Charities at 1-866-541-1821 to register by phone. TCPC is open to all who have experienced the trauma of clergy sexual abuse. The purpose of this group is to gather victims/survivors/thrivers in a safe, supportive environment to share their experiences, listen to others, and explore healing. Contact Jim with questions, concerns or comments 773-412-0909 or richter316@aol.com. On the 2nd Wednesday of each month, there is support available for caregivers of those with memory loss at Three Links Care Center Conference from 4-5 PM. Contact Tana Kelly, 507-664-8821, with any questions. A bus trip to St. Joan of Arc will be held on May 5th from 10:15 AM – 2:30 PM. Catholic Mass with a celebration for Fr. Denny’s end of service in Northfield will be on Sunday, May 26th at 5 PM.